What is the difference between statistical and substantive significance? Statistical significance reflects the improbability of findings drawn from samples given certain assumptions about the null hypothesis. Substantive significance is concerned with meaning, as in, what do the findings say about population effects themselves? Researchers typically estimate population effects by examining representative samples. Although researchers may invest considerable effort in minimizing measurement and sampling error and thereby producing more accurate effect size estimates, ultimately the goal is a better understanding of real world effects. This distinction between real world effects and researchers’ sample-based estimates of those effects is critical to understanding the difference between statistical and substantive significance. The statistical significance of any test result is determined by gauging the probability of getting a result at least this large if there was no underlying effect.The outcome of any test is a conditional probability or p value. If the p value falls below a conventionally accepted threshold (say .05), we might judge the result to be statistically significant. The substantive significance of a result, in contrast, has nothing to do with the p value and everything to do with the estimated effect size. Only when we know whether we’re dealing with a large or trivial sized effect, will we be able to interpret its meaning and so speak to the substantive significance of our results. 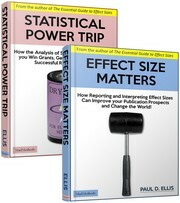 Note, though, that while the size of an effect size will be correlated with its importance, there will be plenty of occasions when even small effects may be judged important. This entry was posted on Sunday, May 30th, 2010 at 11:54 pm and is filed under interpreting results, statistical significance, substantive significance. You can follow any responses to this entry through the RSS 2.0 feed. Both comments and pings are currently closed.